More often than not, I've driven home after weddings. I don't drink, so it's no big deal for me to drive home at the end of the night. But there are the occasions where the wedding is far away and we have to stay overnight. That means packing a bag. If you're like me, you probably overpack and then end up not needing half the stuff in your suitcase. So I'm here to help. 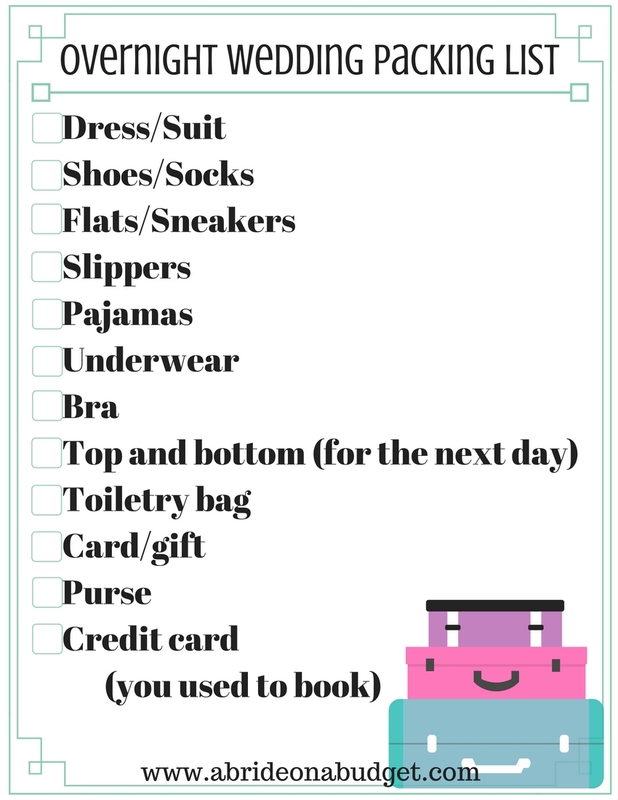 I put together a list of what to pack for an overnight wedding. Even better, I actually made a free printable for you too. All you need to do is print it out, check off the items as you put them in your suitcase, and you'll have everything you need -- plus room for the welcome bags the couple is probably giving out. 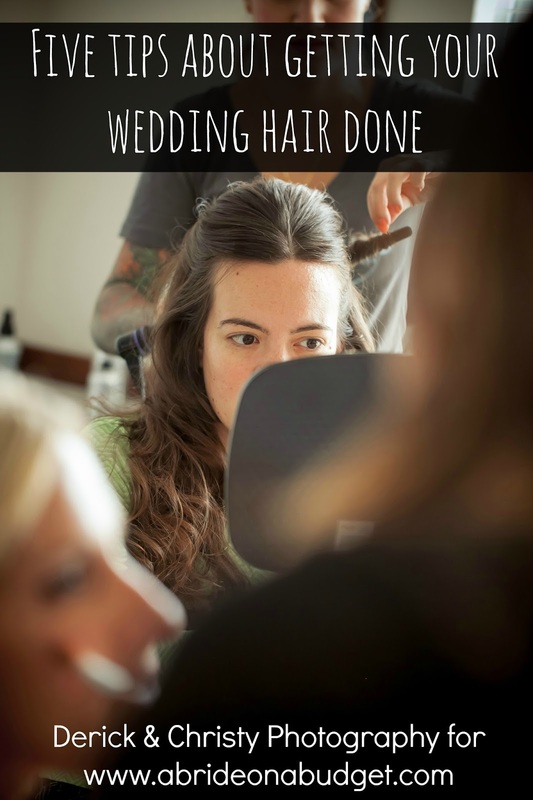 If you can leave early in the day and check into your hotel before the wedding, it means you'll probably also have time to get ready at the hotel. So you'll need to pack whatever you'll be wearing for the ceremony and reception. If you're driving up, you probably won't be driving up in heels. So you have to remember to pack your shoes. And if you're a man, you'll need to pack your dress shoes and a pair of socks. Even if you don't need a pair for that day, you'll need them for the next day. I have a few pairs of really comfortable heels that I will wear all wedding long. And then I have some other shoes that are so cute, but halfway through the reception, I'm done with them. For weddings where I decide to wear those, I need to make sure to pack flats or flip flops. If you pack something like that, you can drive home in them the next day. If you don't, remember to pack flats or sneakers to drive home in. I always want slippers when I'm in a hotel. You don't want to put your shoes on the bed, but you also don't want to walk barefoot around the room itself. So slippers are a must. Plus, they're just so cozy and who doesn't want to be cozy as often as possible? If you're going to sleep over, you're gonna need something to sleep in. So pack pajamas. In my worst cases of overpacking, I always pack a pair of long pajama pants, shorts, a tank top, and a sweatshirt. All for bed. Don't be like me. Instead, keep in mind that a hotel room has a thermostat so you can bring one pair of season-appropriate pajamas and be okay. This is a given, although I feel like underwear are the most forgotten thing when you're packing for a quick overnight trip. Chances are, you're wearing a bra with your dress for the wedding. But, true story: on my wedding day, I didn't wear a bra. The dress fit just right. So the next day, when I showered and was getting picked up for church, I realized I didn't have a bra to wear. So now I make sure to always pack one, based on whatever type of dress I'm wearing. Top and bottom (for the next day). What are you wearing the next day? Whatever it is, you're gonna need to pack it. If not, you'll be wearing the outfit from the day before again. I have a travel bag where I keep a travel-sized version of everything I need for an overnight trip. Then, when it's time to go, I just put that bag in my suitcase or overnight bag. Quick rundown of everything you might want to keep in your toiletry bag at all times: makeup, makeup remover, toothbrush, toothpaste, razor, shampoo, conditioner, body wash/soap, brush, hair ties, bobby pins, hair spray, nail polish, and cotton swabs. Don't forget your card or your gift. You'll want to make sure you definitely have that with you. 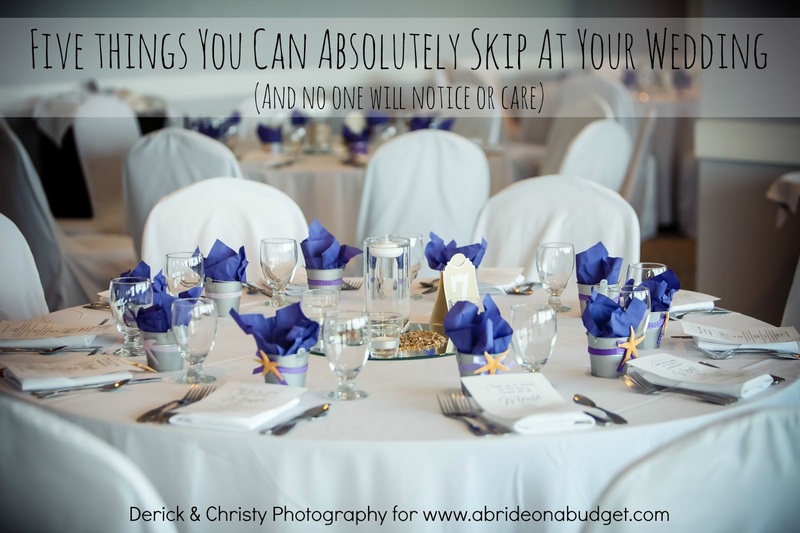 Your daily purse is probably not the one you're going to bring to the wedding reception. You probably have something cute and sparkly with a silver chain that only comes out on special occasions. Be sure to throw that in your suitcase or overnight bag or you'll have to wait for another special occasion before you can use it again. Credit card (you used to book). When you're checking in to your hotel, you may be asked for your name and the credit card you used to book the hotel. It may be different than the one you want to pay with, but they often want the credit card you booked with. So be sure to have that handy just in case or you may be in for a delay when you arrive. The overnight wedding packing list above is formatted to fit on an 8.5x11 piece of paper (so a typical sheet of printable paper). Right click it to save it to your computer. When you need it, just print it. You can reuse it for every overnight wedding if you stick it in a paper sheet and use a dry erase marker to check off the boxes. What else would you pack for an overnight wedding? This is a great list! It's so easy to over-pack, and yet it's easy to forget stuff too. 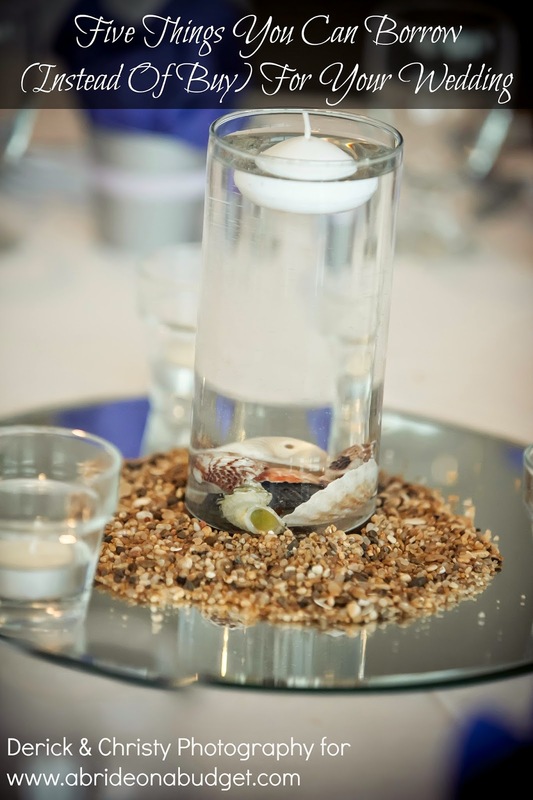 Thank you so much for sharing this post with us at the Hearth and Soul Link Party. Sharing! Fantastic list! I am very guilty of over packing, so this is definitely a list I will use! Thank you for sharing at Celebrate It! I think over packing is second nature, lol. Thanks for the tips and sharing them on Sunday's Best.